The bumper Muddy Easter ‘What’s On’ Guide! Aggh! We’ve run out of time! The Easter holidays are upon us *clonk* there they are. And are we ready? Are we heck! Fear not because you will be ready my intrepid readers once you’ve sat down and read through this lot with a stiff gin cup of tea. My bumper guide is packed full of loads of ideas to keep the kids happy and you sane (well, not really but I think that’s expecting a bit much). Anyway, I’ve put some highlights first, then you’ll find easter egg hunts, farms to visit and finally things to do further afield if you have the energy to actually make it across the border. Thought you’d seen it all? Bet you haven’t seen a Lamb National before? What a hoot! Founded in 2010 by HRH The Prince of Wales, The Prince’s Countryside Fund is dedicated to securing a sustainable future for British agriculture and the wider rural economy. The inaugural raceday last year raised over £380,000 for The Prince’s Countryside Fund and returns this year with an afternoon of competitive jump racing and a host of countryside inspired activities including a petting farm, storytelling with Peter Rabbit, Morris Dancing, bulb planting, falconry displays, pony rides, chainsaw carving and the annual ‘Lamb National’ (which always causes great hilarity – Prince Charles had a fit of the giggles watching this last year and appeared all over the tabloids). 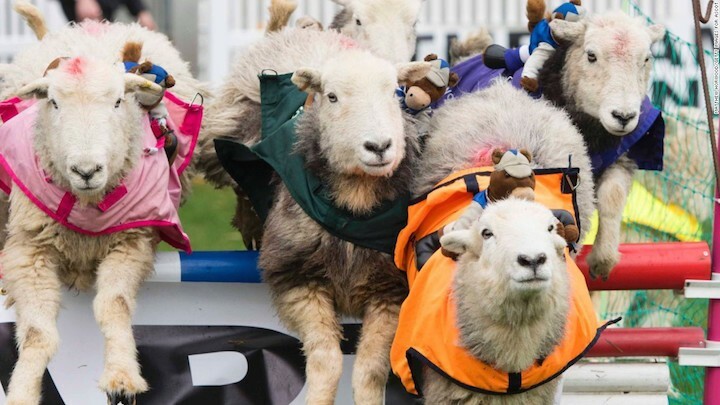 This is a fun day out and also a simple way to teach kids the role the countryside plays in our everyday lives (and a helpful reminder that lambs and chickens don’t actually come from the Ocado man). Tickets: from £23 per person, children go free. Bring the whole family for a journey to the Far East at The Savill Garden this Easter. Collect your adventure packs and take the Easter Dragon Trail, as you travel through the spectacular Savill Garden searching for clues amongst the amazing collections of exotic plants, flowers and trees from distant lands to win a delicious chocolatey prize. The Savill building has a brilliant café with loads of space so gather a few mates with their kids and make a day of it. Price: £2.50 per trail and adult admission fees apply. 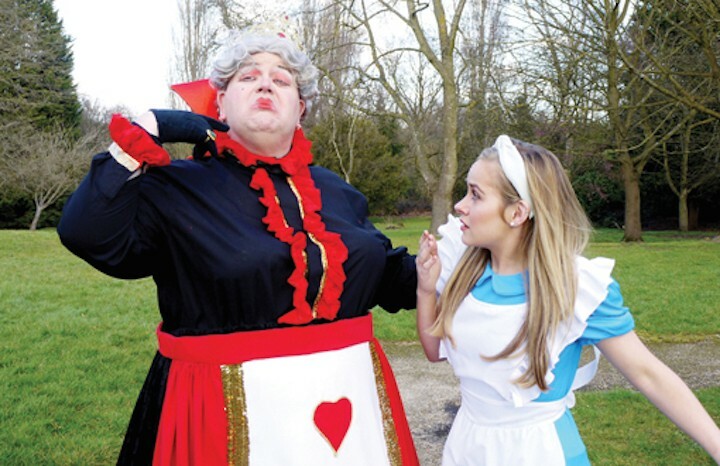 More Alice at the gorgeous Kenton Theatre just over the border in Henley-on-Thames. 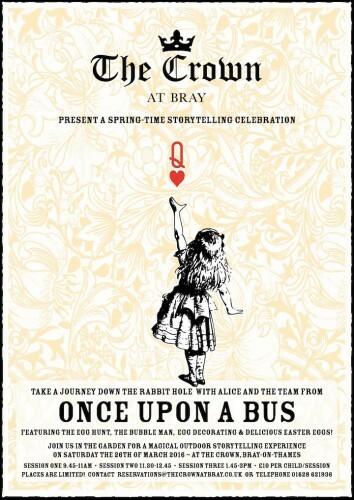 Drop down the rabbit hole to a magical place in Wonderland, keep your head firmly on your shoulders and stay on the good side of the Queen of Hearts, plus attend a tea party that would make anyone go mad. Perfect of the kids and a real Easter treat to get them out of the house and off their screens! This has a great cast with lots of great songs and some fun banter. Tickets: Adults £16, children £13, Family (2 adults; 2 children) £52. Just on the Berks/Bucks border Odds Farm is such a popular place, particularly if you’ve got younger children. And it’s running its popular Activity Day Camps throughout the Easter hols, from 29 March to 8 April for 4 to 12 year olds. Plus, over Easter you can solve the Spring Trail and receive a yummy treat. 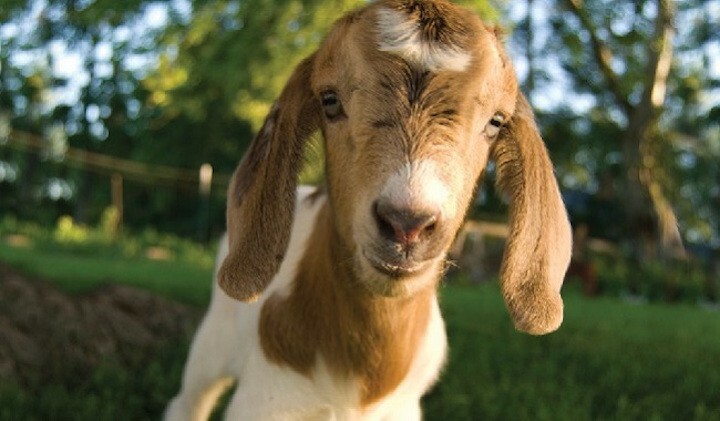 Kids can bottle feed kids (goats! ), jump on board the daily tractor and trailer rides for a fun tour of the farm. There’s also the giant indoor play barn if the weather’s looking dodgy and Marmalade’s tea room (for your sanity). Plus adventure maze, go-karts, log play areas, sand and water play and crazy golf. Get them off the sofa and onto the water with the introduction to watersports at Bray Lake, and skill development for those who’ve had a go before. Split into week 1 and week 2 you can choose from, 2, 3 or 5 day courses including intro to watersports and windsurf coaching sessions in week 1 (28 March to 1 April) and dinghy sailing for beginners and improvers in week 2 (4 April to 8 April). The sessions are suitable for kids 8+ or 10+ and prices range from £59 for a day course to £259 for a week. You get to nip to The Hind’s Head for lunch with Heston while you’re waiting! 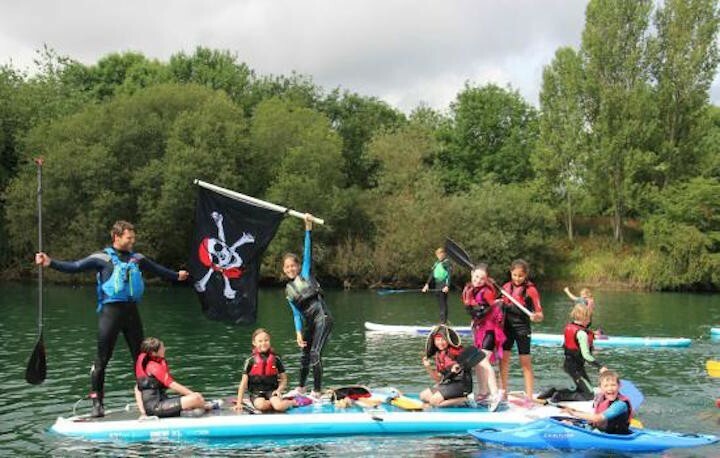 Dinton Activity Centre’s Wild Days offer a wide variety of adventurous activities for children to keep fit, make new friends and develop water confidence. Suitable for ages 8 to 13. Price: £35 a day or £157.50 for the week. Kids can try two activities per day including climbing, sailing, kayaking, stand up paddle boarding, raft building and more. 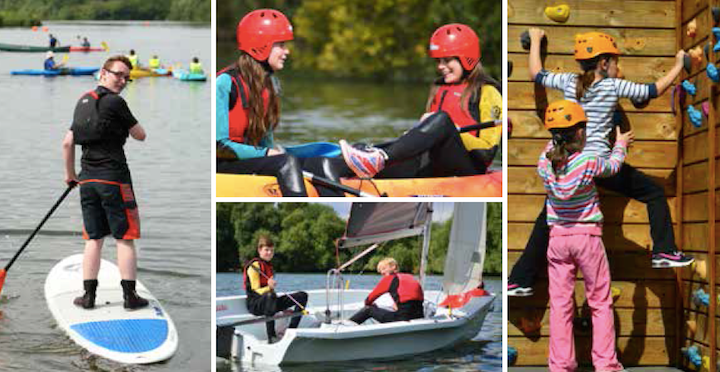 Adventure Days for Teenagers is aimed at 13 to 17 year olds and introduces teenagers to the basics of sailing, canoeing, kayaking and stand up paddle boarding whilst working towards qualifications. Suitable for ages 13+. Meanwhile in the centre’s Junior Sailing Weeks budding sailors can hone their skills in the centre’s growing dinghy fleet whilst working towards their RYA Junior Sailing stages. They’ll also enjoy loads of races, games and challenges. Suitable for ages 8 to 16. Price: £210 for the week. All the courses run from 29 March to 1 April and 4 April to 8 April. Not forgetting the Egg Hunt! You can hunt for the Easter bunny around the park, follow the footprints and look for signs and clues. 25 to 28 March 10.30am to 6.30pm at Dinton Activity Centre. £3 per map and prize. The Dragonfly Café does really good sandwiches, jackets etc. and a great range of cakes and the new adventure playground is absolutely brilliant (though obviously will be heaving, so take some deep breaths and find your happy place). Dinton Pastures Country Park, Sandford Lane, Hurst, Reading, Berkshire RG10 0SU. Tel: 0118 934 4424 website. HaaHoos is the largest pottery, painting and party centre in Berkshire so the kids will have a fantastic arty and crafty time with friendly and helpful staff leading the supervised sessions and inspiring your child’s creativity. Art Clubs run from 10.30am to 12.30pm and cost £20 per child. Suitable for ages 6 to 12 years old. Includes drinks and biscuits. Tues 29 March: Funky foam clay animals; Thurs 31 March: Dream big pillowcase; Tues 5 April: Graffiti canvas pottery painting; Thurs 7 April: Marvellous mosaic madness. Call HaaHoos on 0118 9321 441 to book. 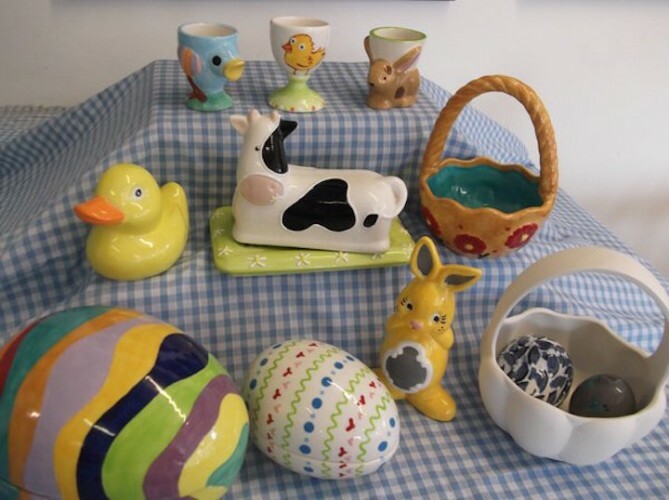 For more pottery fun (it’s always a great fall back if the weather is dodgy) check out Mad Hatters Pottery Painting Café in Tilehurst who are open throughout the Easter holidays (closed on Easter Sunday and Monday). Prices start at just £4.95 for the bisque plus a studio fee of just £1.95 per painter, which covers the cost of all the paints, tools, equipment and the glazing and firing of your finished creation. They have stocked up on Easter pottery items in readiness for your arrival! Plus they do freshly ground coffees and speciality teas, incredible hot chocolate, cold drinks, home made cakes and snacks and there’s plenty of parking. Leapfrog Ceramics has three studios across Berkshire in Thatcham (nr Newbury) Arborfield (nr Reading) and Warfield (nr Bracknell) – all open throughout the holidays (apart from Easter Sunday and Monday). 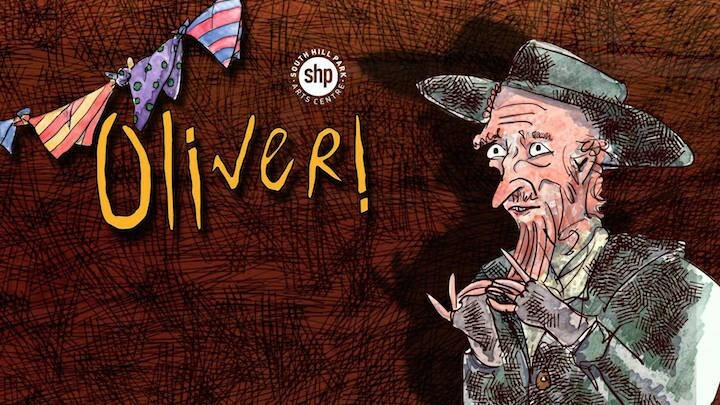 Calling all young performing urchins, South Hill Park needs you for its Easter production of the musical, Oliver! If you’re aged 6 to 16 and love acting, singing and dancing, then ‘consider yourself’ the perfect candidate for this school holiday boredom buster! It’s a week long performance school during which you will rehearse your socks off before taking to the Wilde Theatre stage to perform in our professional musical production for the public. As well as giving each young performer the chance to perform in front of the public, this is also a great opportunity to learn from a professional director and creative team. For full details and rehearsal and show dates check the website. No experience is necessary, just bags of enthusiasm! Price: £175 per child, £150 for siblings. A popular play with clay session held in the Pottery Studio for children 8 to 12 with artist in residence Karen Marks. Explore the exciting possibilities of working with clay using simple hand-building techniques. Price inclusive of materials. Work will then be glazed and fired ready for collection approximately 2 weeks after the workshop. By the end of the workshop students should be able to produce a hand built and decorated ceramic item. Price £18. Book now as it’s always a popular workshop. Spring might well have sprung (at long flippin’ last!) 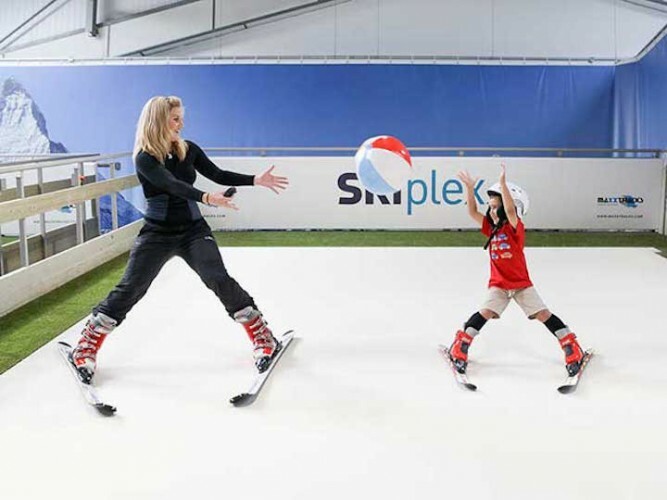 but it’s always winter at Skiplex (without the sub-zero temperatures) a brilliant indoor ski centre in Woodley. Me and the Muddy family gave it a try recently and we all loved it – read my review. The Easter Camps include a mixture of on slope activities – games, sledging and skiing – and off slope activities. Suitable for children 6 to 11, price £50 per child per day. The camps run on 29, 30 and 31 March and 4, 5 and 6 April. Full details on the Skiplex FB page. 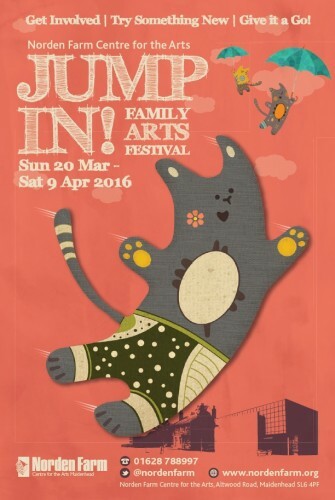 This excellent arts festival for children, young people and families at Norden Farm, continues throughout the Easter hols with a great line up of shows, workshops, arts and crafts sessions and more. Highlights include Stig of the Dump, the Card Ninja, Next Steps: Dance Intensive – where children aged 9-12 can experience life as an A-Troupe dancer rehearsing in a real dance studio, learning routines and putting on a show at the end of the week. On Fri 25 March is Give it a Go! a day crammed full of workshops for children and families where you can try something new like circus skills, magic, comic book animation or making chocolate lollipops! Tickets range in price from £3 for a workshop to £10 for family shows but you can buy a Festival Pass for £15 for 2 family shows and a film. Right then eggs-a-go-go! Kicking off with our glorious National Trust properties which will all be running Cadbury’s Easter Egg trails in their beautiful gardens over the Easter weekend (Fri 25 to Mon 28 March) including Basildon Park, Cliveden and Greys Court and Maidenhead and Cookham Commons. £3 per child plus normal admission charges. Follow the Easter Trail at Beale Park between 24 March and 11 April. Just complete the trail (50p) and hand it in to get your Easter treat. 10am to 4pm, 50p and normal admission charge. There’s an Easter Eggstravaganza at Bucklebury Farm Park – help bottle feed the baby lambs then head off on the great Easter egg hunt through the woods (Fri 25 to Mon 28 March). 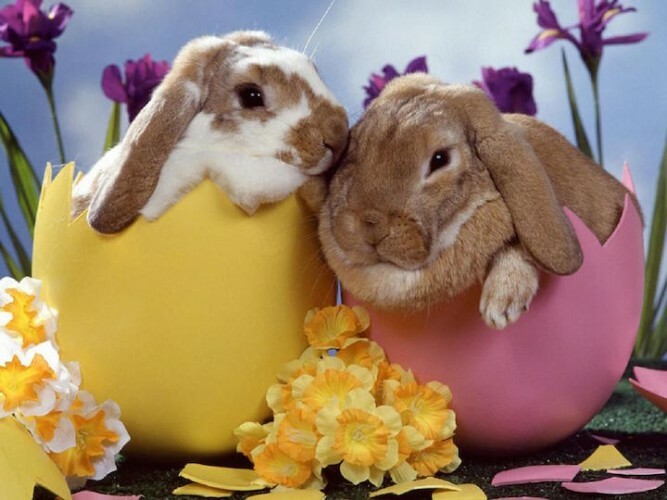 Wellington Country Park just on the Berks/Hants border has a Mega Egg Hunt Trail on 27 March and there are also loads of other Easter activities as well as the normal attractions. Newbury’s Giant Easter Egg Hunt takes place from 25 March to 2 April throughout the town centre. Collect your entry form (daily from 10.30am to 4pm) from Parkway’s Easter Toy Workshop or the Main Square in the Kennet Centre follow the clues, work out the caption and you’re in with a chance of winning some fab prizes. Parkway also has lots of workshop activities, free face-painting, arts & crafts and treats. Head to Caversham Court Gardens on Sat 26 March from 2pm to 4pm for an Easter egg trail on a nature theme in the lovely riverside gardens. Entry is free but a donation to the Friends of Caversham Court Gardens will be appreciated (they are hosting the event). The Tea Kiosk will be open for you to wet your whistle. Enjoy an action-packed Easter adventure exploring Lily Hill Park on Thurs 31 March, 1pm to 3pm. Solve a series of clues and earn yourself a chocolate prize. The course should take about an hour to solve. Cost: £2. Booking required, call: 01344 354441. Just over the way in Henley, the River and Rowing Museum Easter Egg hunt is through the galleries (so see David Hockney’s exhibition while you’re there!) Daily, 24 March to 12 April. And finally – FINALLY!! – if you’re in London then Kew Gardens trumps the lot with a Lindt Gold Bunny Flavour Trail and lots of other choc-tastic events. Is that it?! Are we done? Lordy, someone sponge me down. If not Easter then when I ask you? What better time is there to fluff a rabbit or snuggle a piglet, and get your fingers nibbled by an over excitable goat (happens to us every time *sigh*). We are spoilt for choice in Berkshire for farms and farm parks, all perfect for visiting over the Easter holidays. Check it. And finally, have a gander at Muddy Stilettos Bucks & Oxon’s Bumper Easter Guide for ideas over in her neck of the woods as there are loads of great places to visit just over the Berks border (and quite frankly, I’d drive at least an hour or two if it meant I was driving towards a day of no whinging and whining). It includes a brilliant day-by-day calendar, plus lots of ideas if you’re heading to London for a day or two, so you really are lucky little bunnies.